The tutorial explains the basics of Excel calculation settings and how to configure them to have formulas recalculated automatically and manually. To be able to use Excel formulas efficiently, you need to understand how Microsoft Excel does calculations. There are many details you should know about basic Excel formulas, functions, the order of arithmetic operations, and so on. Less known, but no less important are "background" settings that can speed up, slow down, or even stop your Excel calculations. Calculation mode - whether Excel formulas are recalculated manually or automatically. Iteration - the number of times a formula is recalculated until a specific numeric condition is met. Precision - the degree of accuracy for a calculation. In this tutorial, we will have a close look at how each of the above settings works and how to change them. These options control when and how Excel recalculates formulas. When you first open or edit a workbook, Excel automatically recalculates those formulas whose dependent values (cells, values, or names referenced in a formula) have changed. However, you are free to alter this behavior and even stop calculation in Excel. Automatic (default) - tells Excel to automatically recalculate all dependent formulas every time any value, formula, or name referenced in those formulas is changed. Automatic Except for Data Tables - automatically recalculate all dependent formulas except data tables. Please do not confuse Excel Tables (Insert > Table) and Data Tables that evaluate different values for formulas (Data > What-If Analysis > Data Table). This option stops automatic recalculation of data tables only, regular Excel tables will still be calculated automatically. Manual - turns off automatic calculation in Excel. Open workbooks will be recalculated only when you explicitly do so by using one of these methods. In Excel 2010, Excel 2013, and Excel 2016, go to File > Options > Formulas > Calculation options section > Workbook Calculation. 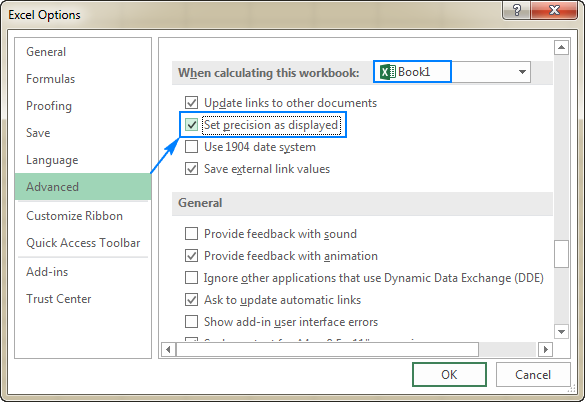 In Excel 2007, click Office button > Excel options > Formulas > Workbook Calculation. In Excel 2003, click Tools > Options > Calculation > Calculation. 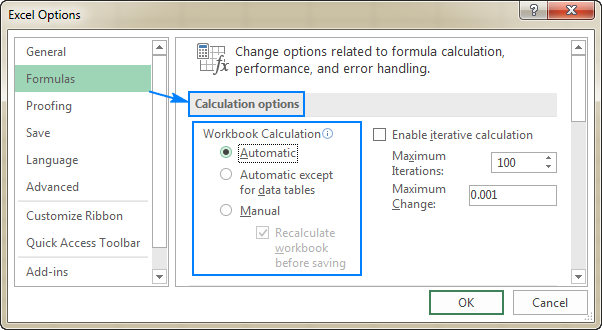 Selecting the Manual calculation option (either on the ribbon or in Excel Options) automatically checks the Recalculate workbook before saving box. If your workbook contains a lot of formulas, you may want to clear this check box to make the workbook save faster. If all of a sudden your Excel formulas have stopped calculating, go to Calculation Options and make sure the Automatic setting is selected. If this does not help, check out these troubleshooting steps: Excel formulas not working, not updating, not calculating. If you have turned off Excel automatic calculation, i.e. selected the Manual calculation setting, you can force Excel to recalculate by using one of the following methods. To manually recalculate all open worksheets and update all open chart sheets, go to the Formulas tab > Calculation group, and click the Calculate Now button. To recalculate only the active worksheet as well as any charts and chart sheets linked to it, go to the Formulas tab > Calculation group, and click the Calculate Sheet button. F9 recalculates formulas in all open workbooks, but only those formulas that have changed since the last calculation and formulas dependent on them. Shift + F9 recalculates changed formulas in the active worksheet only. Ctrl + Alt + F9 forces Excel to recalculate absolutely all formulas in all open workbooks, even those that have not been changed. When you have the feeling that some formulas are showing incorrect results, use this shortcut to make sure everything has been recalculated. Ctrl + Shift + Alt + F9 checks formulas dependent on other cells first, and then recalculates all formulas in all open workbooks, regardless of whether they have changed since the last calculation or not. Microsoft Excel uses iteration (repeated calculation) to compute formulas that refer back to their own cells, which is called circular references. Excel does not calculate such formulas by default because a circular reference can iterate indefinitely creating an endless loop. To enable circular references in your worksheets, you must specify how many times you want a formula to recalculate. In Excel 2007, click Office button> Excel options > Formulas > Iteration area. 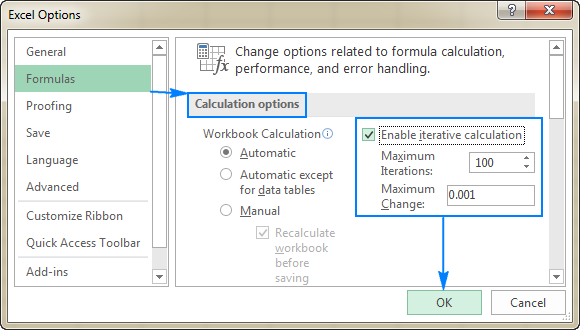 In Excel 2003 and earlier, go to Menu> Tools > Options > Calculation tab > Iterative Calculation. In the Maximum Iterations box, type the maximum number of iterations allowed. The higher the number, the more slowly a worksheet is recalculated. In the Maximum Change box, type the maximum amount of change between the recalculated results. The smaller the number, the more accurate the result and the longer a worksheet recalculates. The default settings are 100 for Maximum Iterations, and 0.001 for Maximum Change. It means that Excel will stop recalculating your formulas either after 100 iterations or after a less than 0.001 change between iterations, whichever comes first. With all the settings configured, click OK to save the changes and close the Excel Options dialog box. By default, Microsoft Excel calculates formulas and stores the results with 15 significant digits of precision. However, you can change this and make Excel use the displayed value instead of the stored value when it recalculates formulas. Before making the change, please be sure you fully understand all possible consequences. In many cases, a value displayed in a cell and the underlying value (stored value) are different. For example, you can display the same date in a number of ways: 1/1/2017, 1-Jan-2017 and even Jan-17 depending on what date format you set up for the cell. No matter how the display value changes, the stored value remains the same (in this example, it's the serial number 42736 that represents January 1, 2017 in the internal Excel system). And Excel will use that stored value in all formulas and calculations. Sometimes, the difference between the displayed and stored values can make you think that a formula's result is wrong. For example, if you enter the number 5.002 in one cell, 5.003 in another cell and choose to display only 2 decimal places in those cells, Microsoft Excel will display 5.00 in both. Then, you add up those numbers, and Excel returns 10.01 because it calculates the stored values (5.002 and 5.003), not the displayed values. Selecting the Precision as displayed option will cause Excel to permanently change stored values to the displayed values, and the above calculation would return 10.00 (5.00 + 5.00). If later on you want to calculate with full precision, it won't be possible to restore the original values (5.002 and 5.003). If you have a long chain of dependent formulas (some formulas do intermediate calculations used in other formulas), the final result may become increasingly inaccurate. To avoid this "cumulative effect", it stands to reason changing the displayed values via custom Excel number format instead of Precision as displayed. Click the File tab > Options, and select the Advanced category. Scroll down to the When calculating this workbook section, and select the workbook for which you want to change the precision of calculations. Check the Set precision as displayed box. This is how you configure calculation settings in Excel. I thank you for reading and hope to see you on our blog next week! 7 Responses to "Excel calculations: automatic, manual, iterative"
Hi, Svetlana, this post is fine. Specially the iterative calculation section was awesome. Thanks. Thank you for your continued support, Imran! Thank you! Thank you! I couldn't figure out why excel wasn't doing the calculations. Somehow under 'Calculation Options', it had changed so that manual was ticked instead of automatic. How to reduce sets of numbers by formula. My mathematic and excel formula is not strong, I have a large number of sets of numbers DATA A1,A2,C1,C2 each set contains 100 numbers and B1,B2 contain 1 number. each number are given (A1+B1=C1),(A2+B2=C2), C1-9 matching C2-94 and C1-99 matching C2-76. my final result number 9 & 99 = B2 . the formula can be use on DATA A1,A2,C1. I believe the quickest way would be for us to have a look at your data. If you can send me your sample workbook at support@ablebits.com, we will try to figure it out. In the e-mail please indicate the link to this blog post and the number of your comment (it is № 3).